I received a Family Dollar Gift Card for the sole purpose of this post. All opinions are 100% my own. NFL is in full swing!!! The games have started. I personally LOVE Football season. It's my favorite game to watch and I along with NFL season comes FALL, my most favorite season!! I know along with NFL, people like to host parties. Parties can be very stressful! But with P&G and Pepsi, you can get all of your party needs at Family Dollar. I received a Family Dollar Gift Card and some sample items to get my game day started! To help prepare for your game you can head off to Family Dollar and get all the supplies you'll need from Procter & Gamble and Pepsi. 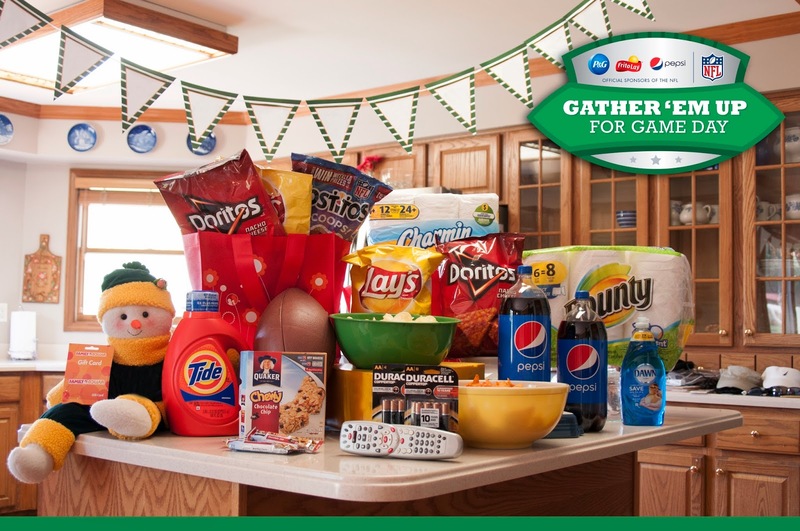 With items like Febreze, Bounty and Duracell you can help prepare for your party. Cleaning, smelling good and making sure the remotes are ready to go are key essentials to preparing for your Game Day Party. 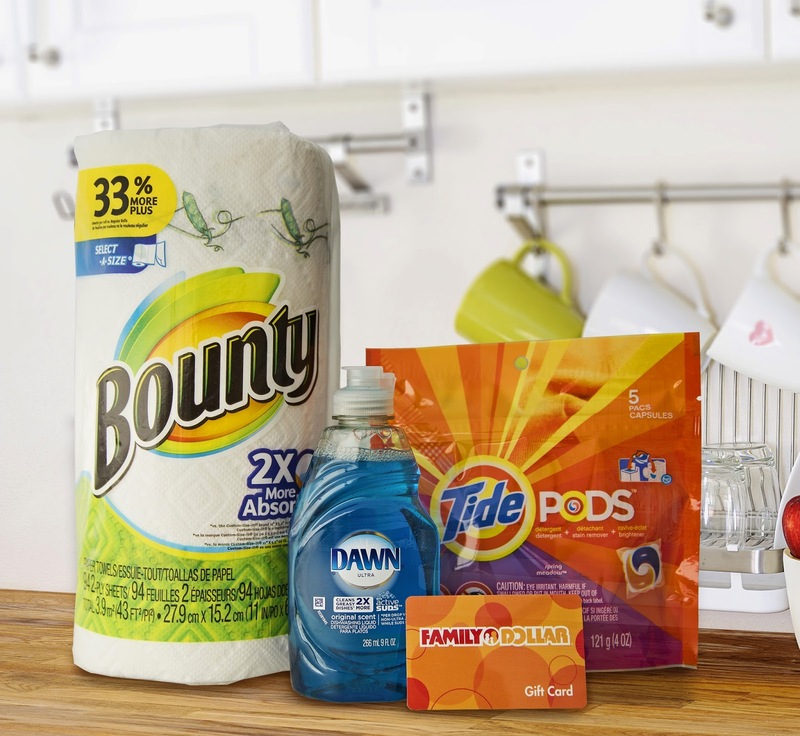 And for when your Game Day is over and your guests go home you have Bounty for cleaning, Febreze for making the place smell good again and Dawn for washing all those pesky dishes. The best part about shopping at Family Dollar is the prices of course. Everything I purchased was at least $.50-$1 off retail prices, but a few were even cheaper than that! I spent a total of $27 and have almost everything I'd need to host an entire game day (with extras left over). You can also visit This Link and get free printable's for your game day party with a Welcome Sign and Custom NFL team Banners! Here's an ida of everything you can get at Family Dollar for your Game Day Party! One winner has the chance to win a $25 Family Dollar Gift Card as well as some wonderful P&G Brand Samples! I would buy pop, Chips and some cheese dip. chips, fruit, veggies and guac. We always get chips and salsa...plus some dips. I would get sodas, chips, paper towels and paper plates! I'd buy chips, sodas, cookies (for the kids) and paper plates and paper towels to keep clean up easy! I'd get chips and salsa/dip, pepsi, and other snacks. I love buying team colors paper napkins and plates at Family Dollar for game day! I would buy chips and dip and some drinks. I would get paper plates and paper towels. I'd buy wings and soda! I'd get pop snackies napkins paper plates and cups. I would buy Doritos, soda, paper towels, napkins and Pizza. I would buy Coke, Chips, Pretzels, and Paper Towels. I would get soft drinks, cookies, and chips. I would buy chips, dip, pizza, soda, plates and napkins. For the game day party, I'd buy some Soda, Chips, Red hot (to make hot wings) and Cream cheese to make some dips! Tortilla chips, soda, salsa, plates, and hot dogs. I would buy paper plates, cups, chips and beverages. I'd buy some Lays Potato chips and soda. I would buy Chips and dip and a lot of pop. I would get Tostitos for nachos, Cheetos & Fritos for snacks, and Pepsi and Diet Pepsi to drink. im gonna buy alot of junk food! I would buy chips, hot dogs, candy, and soda! I'd buy a bunch of decorations like nice napkins, paper plates, and more. I would buy some soda and chips to snack on. I would buy tortilla chips and salsa, crackers and soda. I would get chips and soda. I'd grab some paper plates and cups. I would buy chips, dips , soda, paper plates, plastic cups and napkins for game day. I would probably buy some soda, chips, and salsa. I would buy a variety of chips, dips and drinks. I would buy a variety of chips, drinks and paper products. Doritos/Corn Chips and the items to make a chili cheese dip in the crockpot to dunk those in and of course, soda. I would buy some paper goods and some snacks! I would buy paper goods,soda, chips, and salsa. Chips, soda, veggies and dip! I would get soda, cookies, ice cream and candy. I would buy some snacks, candy and cokes! id buy chips and candy! I would buy veggies and dip, hot wings, and ingredients for nachos. I'll get chips, salsa and tea. I'd buy chips, salsa, dip, Coke, Mountain Dew for my party! I would buy chips, dip, and soda. Thanks for the giveaway… chips, soft drinks, & paper goods !